When I started gathering ideas for the kids’ room, this one was one of the first I saved. I was so impressed with the difference that I just *knew* we needed to definitely cover our chair cushions. The only issue is that my sewing skills are very….um, let’s call them “Basic?” So I needed to sort of fumble my way through it and I wound up basically making slipcovers. There are mistakes. A lot. I won’t point out that the cover for the back cushion isn’t quite long enough. Or that the round edges are all puckering. Or that when I traced the pattern onto the fabric, I didn’t even think about it and the pattern on the fabric is going in different directions on the seat cushion vs. the back cushion. I’ll focus on that fact that I LOVE it – it looks zillions of times better than before, they’re washable, the fabric is just perfect. It adds just the texture I wanted and only cost $2/yd for a total of $6). 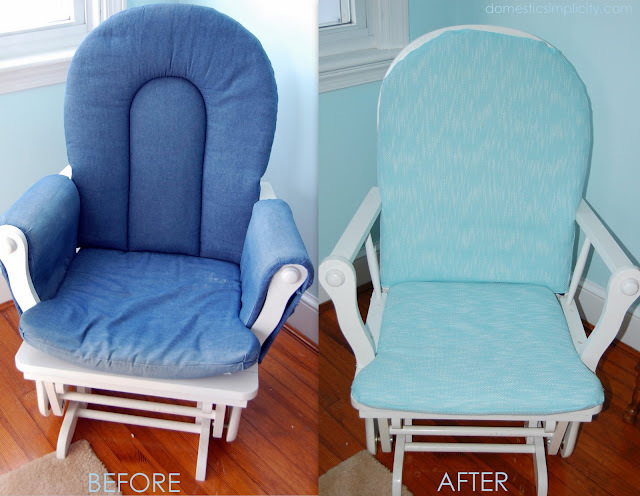 $20 for the chair at a consignment store 2 years ago + $6 for fabric = $26 total with the chair – Not too shabby! -To make a “pattern,” I traced the cushions onto the fabric. I should have gone back and added another marking about 1.5″ wider than my initial mark for seam allowance. I’m just getting started with this sewing thing, so live and learn! The covers are tight, but the fabric will stretch. wide, short(is that the right word? It looks like a serged stitch if that makes more sense?) stich to reinforce. -I could have recovered the arm covers, but it wasn’t really worth it. -I had 3 yds of fabric and it was just enough. If I had decided to cover the arms again, I would have need to piece together two larger pieces of fabric for each arm. It would have been easier to have 3.5yds of fabric and not deal with extra seams, etc. so I just skipped the arms. ← The NY Times No-Knead Bread is so 2006? Looks nice! I like the material you selected. I hope you’ll drop by AtticMag to tour my home. That fabric is gorgeous!! What a find! And, I’m very impressed with your sewing… I get stuck at threading the needle 🙂 Good job!!! oh man.. what are you talking about? that is awesome..looks perfect to me! Love the texture of the fabric like you said and the color! i cant wait to see their room…you really are torturing me here… i think im posting serge’s tonight, i keep forgetting to take pics in the natural daylight..ugh.see you over at gnowflings:)yay!